Nancy Tillman is the author and illustrator of the New York Times-bestselling picture book, On the Night You Were Born; its companion journal, The Wonder of You; The Spirit of Christmas; Wherever You Are, My Love Will Find You (also a New York Times bestseller); The Crown on Your Head and I'd Know You Anywhere, My Love. She also created the mischievous cat Tumford in Tumford the Terrible and Tumford’s Rude Noises, and illustrated It’s Time to Sleep, My Love by Eric Metaxas. Nancy lives in Portland, Oregon. 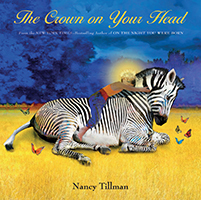 We know our children are special, and now, in The Crown on Your Head, the incomparable Nancy Tillman expresses this universal feeling in the most touching of ways: Every child is born with a crown. The crown is everything that gives us unique value. Our crown will always be with us wherever we go, whatever we do.